As our “fur kids” age, like us humans, they start developing debilitating conditions such as IVDD (Intervertebral Disk Disease). Some breeds are more susceptible than others. IVD degeneration is more prominent in chondrodystrophoid breeds than non- chondrodystrophoid breeds and more prevalent in older dogs than younger dogs. Dogs such as Dachshunds, Beagles, French Bulldogs, Labrador retrievers, the Pekingese, Pugs, Basset Hounds, Corgis, Cocker Spaniels and more have the highest incidence of this debilitating and painful disc herniation. What causes IVDD in Dogs? Intervertebral discs are the cushions between each vertebrae of the spine. Each disc is made of a fibrous outer ring known as the anulous fibrosus that surrounds a an inner-gel known as the nucleus pulposus. The discs act like both shock absorbers and connectors, and are good at cushioning forces straight up and down the length of the spine, but are not as good as at cushioning twisting or diagonal forces. Overtime, the accumulative result of the twisting and diagonal forces contributes to the outer coating of a disc to rupture causing the gel to escape out and compress on the spinal cord. This causes intermittent pain and may also lead to complete paralysis. Small to medium-sized breeds appear to be at an increased risk of developing IVDD and in particular those that are chondrodystrophoid. In the case of the Dachshund, they are at the greatest risk of developing IVDD more so than other breeds. Studies show that the Dachshund represents between 45-73% of all acute IVDD in dogs. When IVDD occurs in Beagles, it is 10 times as more likely to target the cervical region than the thoracolumbar region. Studies show that 95% of French Bulldogs in America suffer from an abnormal spine so Frenchies. They start developing pain in the neck and or back between ages 4-8 years. Does the Dachshund long back and short legs cause IVDD? A misconception is that the Dachshunds’ long back causes IVDD. Chondrodystrophoid breeds, like Dachshunds, have an accelerated form of IVD degeneration. This predisposition results in herniation of the IVD and disc displacement known as Hansen I IVD herniations. Studies show that there is no correlation between back length and IVD degeneration. The main culprit behind IVDD in Dachshunds is the gene they carry that causes them to have short legs. That same gene known as chondrodystrophy causes the gel in the disc to become calcified and thus hard losing its elasticity. Another remarkable finding, is that Chondrodystrophoid breed dogs (CD) with a shorter spine, larger height and a larger pelvic area are more susceptible to IVD herniation. Take the example of Labrador retrievers, their biomechanical and physical factors are different to that Dachshunds, yet, they typically present disc degeneration between ages 5-12 years. Signs of IVDD in Dachshunds as is the case of all CD dogs are presented at early age. In general however, Dachshunds tend to have the widest discs of any breed. Moreover, they have discs that calcify as they age. 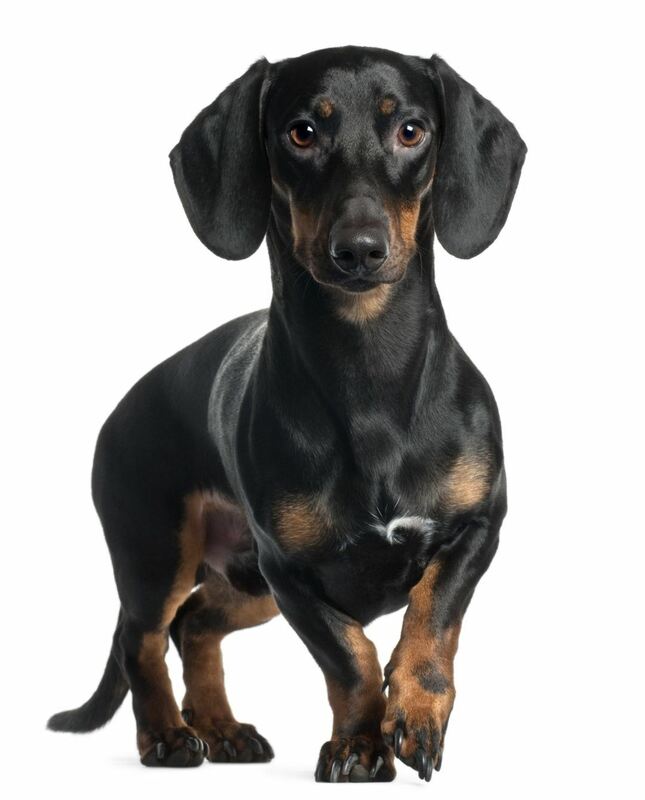 Unfortunately, about a quarter of all Dachshunds will develop IVDD during their lifetime with the majority of them presenting disc degeneration between ages 3-7 years with age 4 being the most common age of occurrence. IMPORTANT: If you see any of these signs displayed in your Dachshund, act straight away, contact your vet and have him checked out. If diagnosed during its early stage, your Dachshund may be prescribed non-steroidal anti-inflammatory medications, corticosteroids, muscle relaxants, acupuncture and strict bed rest. Where IVDD has progressed, surgery coupled with physical therapy may be required. Surgery involves removing the herniated disc and decompressing the spinal cord. Surgery is successful in the majority of the dogs with acute disc herniations and most dogs take 6-8 weeks to recover. Those with Hansen Type II take a little longer to recover. After surgery your Dachshund should take it easy and avoid running, jumping, hoping on and off furniture and physical therapy has proven beneficial if done immediately after surgery to help regain strength. It’s important to note that many dogs with IVDD are managed well without undergoing surgery. This is especially the case, if the disease is caught and treated early during the prognosis and if pet owners are consistent and meticulous about strict crate confinement during the entire recovery period. IMPORTANT: If your dog receives pain subsiding medication, be aware that the symptoms may be masked or you may think your pupster is fully recovered since they begin to show improvements. Don’t be fooled by the immediate effects of the medication and don’t become lax about his strict cage rest and limiting his mobility during this period. A lot of well-meaning owners fall foul of this and as a result slowing down their full recovery. On the downside, the recurrence rate is around 50% especially in the case where owners have become lax about monitoring their dog’s movement and physical exercising including obesity and a poor diet. The cost of neurosurgery for Hansen Type I IVDD cases (known as slipped disc) range between $3,000 and $4000. This includes the cost of surgery, consultation fees and overnight fees. Be prepared for follow up costs that include radiography and CT imaging after surgery, meds and vet follow-ups. For Hansen Type II IVDD surgery, the costs are higher. Finding affordable insurance for your Dachshund is imperative - since there is a one in four chance your dog is going to require treatment. Regular physical therapy is recommended post-surgery, since studies show it has been successfully used in both speeding up recovery and reducing the recurrence rate. This alternative type of treatment involves a series of acupuncture, physiotherapy, electrostimulation, massage or laser treatments. Ask your vet to develop a recovery plan involving physical therapy after surgical intervention. Post-surgery or any treatment received for IVDD, a well-padded bed is a must, and recumbent Dachshunds should be regularly turned to help prevent development of pressure sores known as decubital ulcers. If your Doxie is overweight, your Vet will prescribe a weight loss program that owners must not deviate from. Keeping his weight down ensures the rate of recurrence is also minimized. Avoid giving him leftover scraps and sugary/high-fat treats since these are the main culprit behind gaining weight. Recovering after intervertebral disk disease, dogs should have minimal mobility while recovering. Using an indoor dog playpen or a crate is best as it limits the space to move around in. 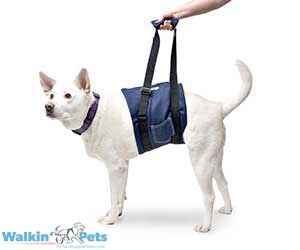 Using a harness or a sling like the one above instead of a dog collar, reduces the strain on the damaged, or recently repaired, vertebrae and keeps the spinal column aligned properly. Limit his exercise during the recovery period ensuring he doesn’t run or jump freely, since these sudden movements can exacerbate spinal damage. The types of exercise that your Dachshund is encouraged to do post- IVDD is swimming or other passive range of motion as these are safe for the joints and spine. To limit jumping on and off furniture or cars, buy an indoor pet ramp or steps for him. These are inexpensive yet highly effective for mending damaged vertebrae. If you’re working or are away during the day, and your Doxie is unmonitored, jumping up and down on the bed or sofa, then all your hard efforts at keeping him safe when you’re home are wasted. Finally, a doggie stroller is a great option for longer walks for when he gets tired or his mobility is impacted in the short-term. It's important that owners use the right pet equipment for their ailing pup... Check out this resource site for lots of rehabilitative equipment and supplies for aging dogs, or those with mobility or other health issues…. HandicappedPets.com. Of course, not every Dachsie is doomed to suffer this debilitating and painful disc disease and we don’t want to dissuade owners from adopting or buying a Dachshund puppy out of fear. But caution is definitely warranted since evidence suggests that IVDD is a genetic condition. To reduce the chances of getting a Dachshund predisposed to IVD degeneration is to buy a puppy with no IVDD family history. If one parent had calcification then the puppy has a high chance of developing IVDD, if both parents, then the risk is even greater. Breeders can find out if a puppy is likely to develop IVDD after 18 months old by performing an x-ray. What if you already have a puppy with family history of IVDD? To better their lives, owners can do a several things, although nothing is guaranteed. Don’t let your Dachshund get overweight, keep him slim. The excess weight puts further strain on the vertebrae and discs. I know it’s hard to resist your Dachshund begging for a treat, but treats throughout the day add up to lots of calories. A good substitute to high-calorie dog treats, are carrots sticks or rice cakes. Another thing pet owners should do is to keep them away from the kitchen while cooking. Scraps and dinner leftovers in addition to their daily dog food may result in your Doxie gaining unnecessary weight. Avoid certain movements to minimize the possibility of injury. Limit your Dachshund from overzealous jumping or vigorous tug-of-war games that can twist the spine. This includes jumping on the couch or off the couch, on and off an SUV or higher vehicles and avoiding long or steep flights of stairs. A pet ramp is great for preventing twisting of the spine or any falls that may damage his spine. Foods rich in lechitin, found in tofu, egg yolks, beef, liver, spinach and wholegrains can help in supporting the fatty case that surrounds the nerve cells of the spinal cord. Crate training your Dachshund is important. If your dog suffers a minor trauma he would get a better rest if he is in a crate and this way you will also ensure limited mobility if you’re not around. Mild forms of exercise for fun and as a preventative measure is encouraged. Daily walks and plenty of activity is key to keeping your Doxie’s muscles strong and stable so that they can continue supporting the spine. Don’t shy away from playing in the park, brisk walks, hiking, earth-dog competitions or even field trials – these are activities that Dachshunds excel in and will keep in top shape and a strong back. What's on the horizon for treating IVDD in Dogs? The video below, is a good example that there is hope in the future for improved and alternative treatments that less invasive and have a higher success rate.